Product Category – now has a new relationship to itself to allow you to define a Parent Product Category for simple hierarchies. Worker Type on the Worker entity has a new value of Unspecified added to the values to support more unmanaged scenarios where the contract in place may not be known by the app immediately. We’ve also introduced a set of new entities to support many-to-many relationships with the Contact entity. This is a common request especially from users for CRM systems who want to bring their data into CDS. The new entities have a very simple schema which allows you to relate a contact to a contact from a selection of other entities. The new entities are optional to use, and the existing relationship from these entities to contact still exist. This release, we've added support in the Office Add-ins to switch between environments from directly inside the add-in. This makes it significantly easier for you to switch between editing entity data between your various environments from directly within the add-in instead of needing to navigate back to the portal and re-launch each time. Then click OK. Presto – the add-in will reload with the entity data from the environment you selected! Now that the Common Data Service has been Generally Available for 3 months, we’re planning on retiring databases created during the Preview period. All CDS Service databases that were created while PowerApps was in preview (prior to October 31, 2016) will be deleted starting February 15, 2017. This change is taking place because Common Data Service databases that were created while in preview are no longer compatible due to enhancements made since GA. If you have a Common Data Service database in your preview environment, you will need to migrate your entities and entity data into another environment. Affected customers should have received an email notification on this topic. See the Migration from Public Preview blog to learn more about how to do this. 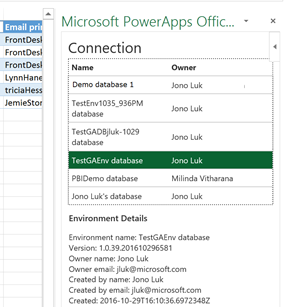 NOTE: If PowerApps-based apps are actively used from a preview environment that connect to the Common Data Service database, then the deletion of that database will be delayed an additional 15 business days, up to a latest end date of March 2, 2017. Folks – we're just getting started! The Common Data Service will be releasing frequently and we'll keep this blog updated with the latest news on what's new and available. As always, we value your feedback and want to hear from you! Please let us know where you're at and what you're thinking via our Community and Ideas forums!